My favorite part about any burger is the crispy edges. When I get the juice from the beef, the spice from the seasonings, and the smoky flavor from the Cowboy Charcoal all in one crispy edge bite, then I am in love! Nothing can beat that moment. So if you are like me, then this Charred BBQ Burger is just what you need in your life. Where do we start with this Charred BBQ Burger? First off, you are going to make a juicy patty. The key to making flavorful patties is not over-forming the burger. No need to smash all of the ground beef together so hard that it is a rock. No, gently create the patty with minimal contact. Once that is done you are ready to season. I like to add my seasoning on the top of the patties & not in the mix. This actually helps to keep the moisture inside the burger, as some seasonings & salts will draw the moisture out. We want a moist Charred BBQ Burger… I’m sure there is a better way to say that. Ready to throw back on the grill! Next, you will throw those patties over some hot all-natural Cowboy Charcoal. 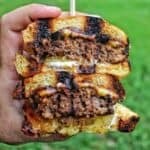 Grill your Charred BBQ Burger and add cheese. Yes, you are going to slice the burger in half while it has a wooden skewer in each half. This is where you will get all the crispy edges! That is why its called the Charred BBQ Burger! Add each half back to the grill, cut side down, and let it char up on that one side. Pull the burger off and devour! All in all, this is a fun twist on a classic backyard burger. Not only do you get a great flavor in the food, but you can easily make it anywhere, in any grill and with great charcoal like Cowboy. So try the Charred BBQ Burger and let me know what you think! On the grill! Lets eat this burger! Sliced and serve an extra crispy burger with this Charred BBQ Burger recipe! Use some Cowboy Southern Style Hardwood Lump Charcoal to light fire and let burn for 10-15 minutes. Once Charcoal is white hot, form into one pile for direct grilling. Form ground beef into 1/2 lb burger patties then season on the outside with smoked paprika, garlic powder, black pepper, cayenne powder & sea salt. Throw burger patties on to grill and let cook for 3-4 minutes per side. 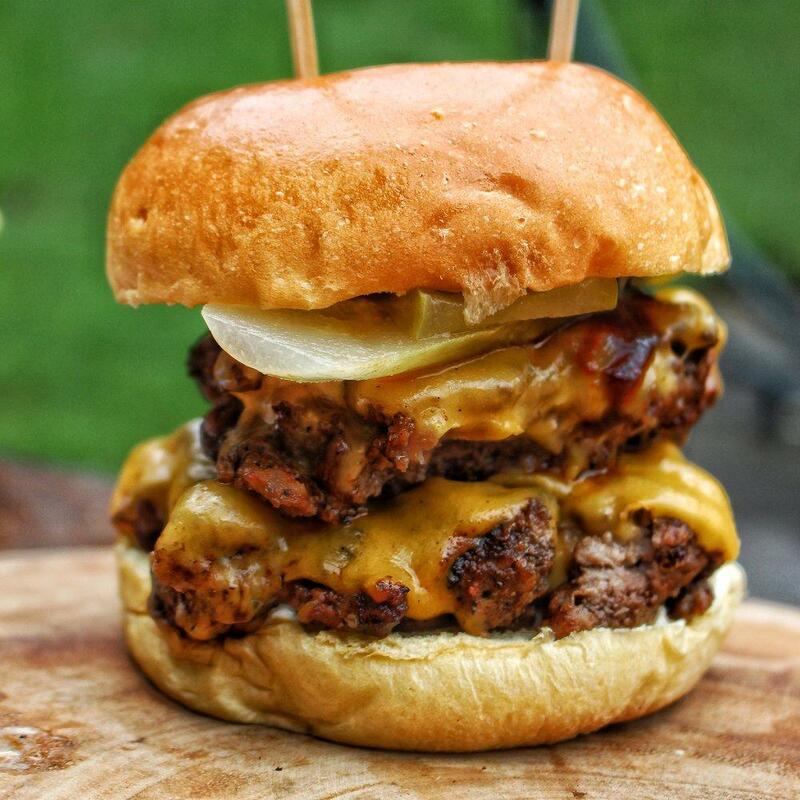 When close to finishing, add one slice of cheese to patty and let melt. On bun, add mayo, 2 pickle slices, burger w/cheese, and top with some Cowboy Smokehouse BBQ Sauce. 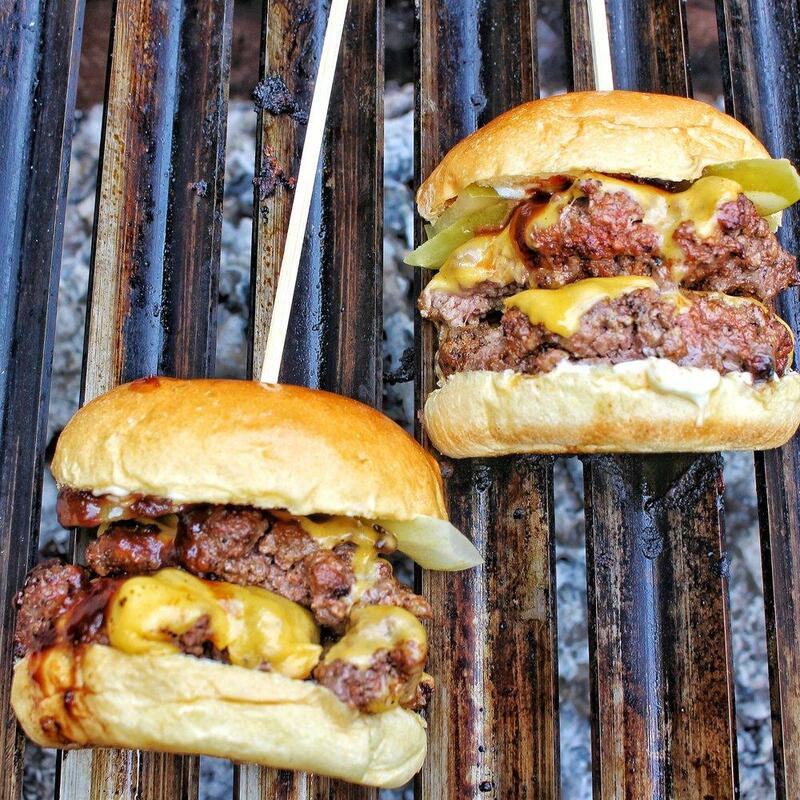 Put two wooden skewers into burger equal distance apart in the center of each half of the burger. Slice the burger in half. Take each burger half and lay on the grill, cut side down, for another 1-2 minutes. Pull off grill & enjoy! Equipment: Cowboy Charcoal, Smokehouse BBQ Sauce, grill, fire starters, wooden skewers & a bread knife.